This piece of white-tailed deer antler from Modoc Rock Shelter appears weathered. The antler is friable and some of the outer layers have flaked off the tine. It has also been modified by humans, but we will discuss that later. Image taken by Bonnie Styles. Many zooarchaeologists record the conditions of the bones to get a sense of overall preservation and bone destruction at a site. Some zooarchaeologists record multiple stages of weathering. Some only note if remains are weathered or not weathered. For Modoc Rock Shelter, we recoded if the bones and shells appeared weathered. When bones have been exposed to the natural elements they have laminated surfaces and a more friable texture. Only a low percentage of bones and shells appeared weathered at Modoc Rock Shelter. Most appear to have been quickly buried and well preserved. The rock shelter overhang also provided some protection. This white-tailed deer innominate (hip bone) from Modoc Rock Shelter is encrusted with calcium carbonate. Image taken by Bonnie Styles. Bones are sometimes stained a reddish color especially if there is iron in the sediments. Sometimes it is difficult to tell red burning from red staining. Some of the bones at both Koster and Modoc have manganese deposits, which appear as black spots. Some of the bones are encrusted with calcium carbonate. These types of deposits are more common on bones recovered in sediments that are at or near the water table in areas where the ground water includes manganese and calcium carbonate. If the bones were continuously damp or wet then preservation may be good, which is the case at the Koster and Modoc sites. If the water table was fluctuating greatly then alternating wetness and dryness would lead to deterioration of bone. We record evidence for carnivore damage to bones. Carnivores including domestic dogs chew on and eat bones. Modern experiments show that dogs can totally eliminate bones from young animals, less dense parts of bones from animals of all ages, and sometimes even the dense parts of bones. There are dog burials and dog bones at both the Koster and Modoc Rock Shelter sites so we know dogs were present. There is also evidence for chewing by carnivores at these sites, but it occurs on relatively low proportions of the bones. We also record gnawing by rodents for these sites. There are rodent bones and rodent-gnawed bones at both sites, but rodent gnawing occurs on low proportions of bones. All three of the specimens in these images exhibit natural modifications. The white-tailed deer sacrum fragment from Modoc Rock Shelter (image on the left) shows small pits and scratches that likely resulted from carnivore chewing on the bone. The indeterminate large mammal bone in the center image also shows evidence for carnivore chewing, and the rounded pits suggest that it may also have been digested. 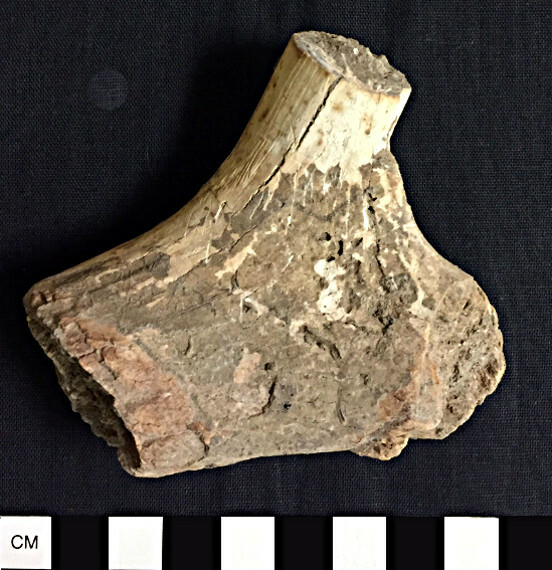 The white-tailed deer antler from our comparative collection shows clear evidence for rodent gnawing. Images taken by Bonnie Styles. The shallow rounded pits and edges on this piece of indeterminate mammal bone from Modoc Rock Shelter suggest that it was etched by stomach acids as it passed through the dietary tract of an animal. Image taken by Bonnie Styles. Digestion of bones leaves characteristic marks, including erosion and pitting from stomach acids. There is little evidence for digested bone at Modoc Rock Shelter and Koster.